Memorial Day is perpetually in my heart. I’m sobered by the realization that my incredible freedoms have been purchased by the blood of my fellow Americans, and I grieve for those who have been lost defending my glorious liberty. May God comfort those who have lost their beloved ones in the service of this great nation. Thank you forever for your unimaginable sacrifices. I appreciated this article on the history of Memorial Day and wanted to share it with you (click below). 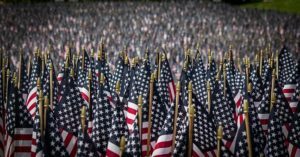 Memorial Day 2018: Holiday history; what’s difference in Memorial Day, Veterans Day?